Highway 160 runs all the way from Durango to our next campground, Big Meadows, ten miles west of South Fork, Colorado. 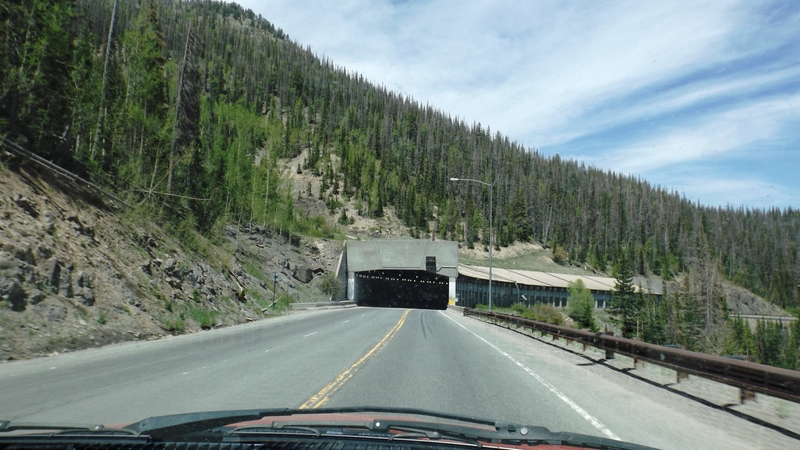 The last 20 miles of that route is remarkable for the Wolf Creek Pass, which climbs from 7,000’ near Pagosa Springs to nearly 11,000’ at the summit. The first ten miles are the climb when heading east, which is also where you meet the switchbacks. The descent comes over the last ten miles, and it’s basically 8% grade in both directions. 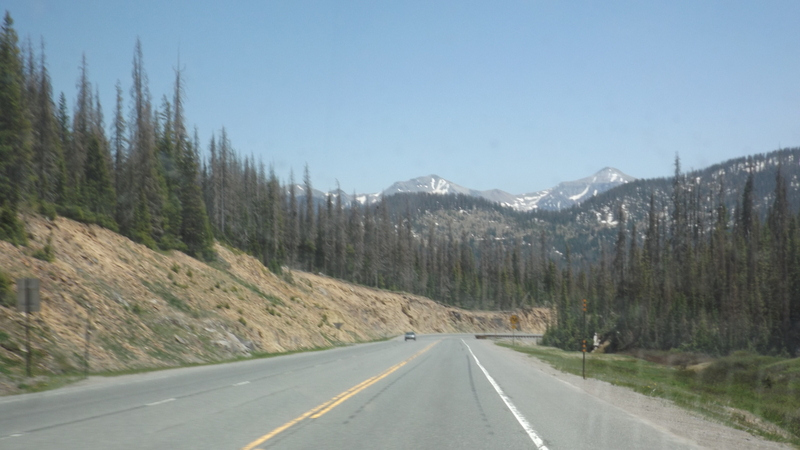 Thousand foot drop-offs always bring sweaty palms, but it is a fine road with plenty of overlooks and passing lanes should one experience mechanical trouble. We unwittingly chose a challenging day to cross the pass. There was a lot of wind, gusting to 50 mph, but more troublesome was a huge bicycle event strung out along our entire 100 mile path on Hwy 160. There must have been 2,000 bicyclists supported by 200 chase vehicles. Climbing Wolf Creek is slow and arduous with a big Dodge diesel pulling your trailer, but it’s got to be much tougher when you’re equipped only with only a $5,000 road bike and two shaved legs. We saw a few flats getting fixed, but no wrecks or injuries. Passing those guys and gals comes with the challenge of giving them plenty of room to sway while timing your move so as to not coincide with an oncoming vehicle. It’s their road too; we dealt with it, but I will admit a tad of annoyance at those who stopped in the road to eat cookies and Gatorade beside a chase car. After all, there is a shoulder. Then again, nobody likes thousand foot drop-offs. 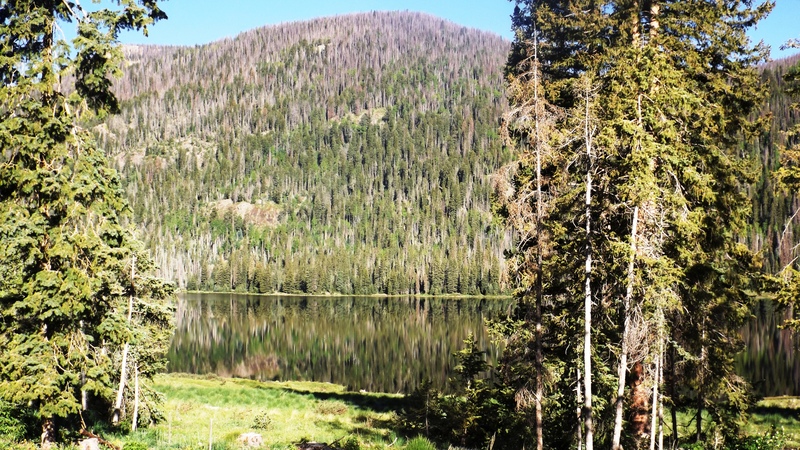 Big Meadows is a USFS campground on the banks of a lovely 600 acre alpine lake. It’s 9,300’ up and the air is thin. The lake is very clear and clean, tempting to the swimmer. 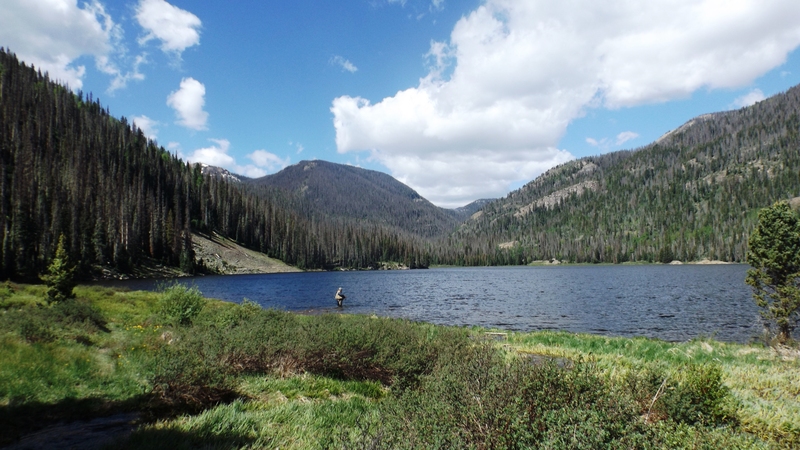 We have a good 4G LTE internet connection here, and we did a bit of research on fishing and the source of the lake’s water. 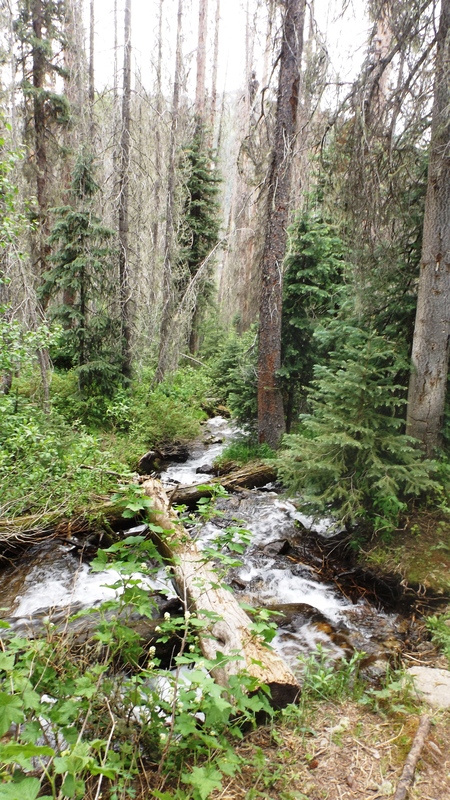 Most of the water comes from snow melt and year-round springs, both being quite cold. If that weren’t enough, it’s a big ice fishing lake, but the Forest Service emphasizes that the ice is usually gone by May. Swimming was quickly and emphatically ruled out. Wood-boring beetles killed most of the trees here over the past few years. We learned from other campers that before the beetle invasion you not only could not see the lake, you couldn’t see other campsites. I miss the trees, but it is a beautiful lake that at times mirrors the forested mountain to the west, and other times resembles a storm-blown Pacific bay. 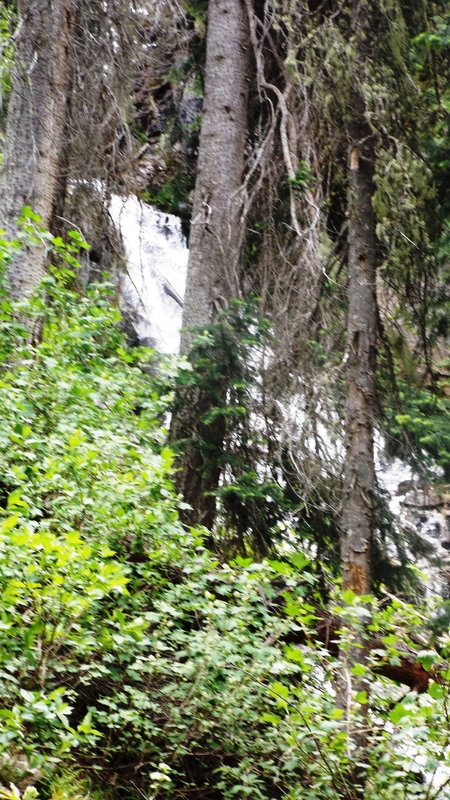 Kat and I took a short, vertical hike to Cascade Falls. That spring water tumbles noisily down the mountain. On the way back clouds gathered and a few drops fell. A thunderstorm came in late afternoon. We saw cloud to cloud lightning, heard a few rumbles, and got just enough rain to bring out that fresh smell of a fir forest. The bugs didn’t kill them all.